The most fascinating new product at this year’s Winter Fancy Food Show (at least from the drinking persective), is apparently a quarter-century old, but I hadn’t heard of it until a December. I was planning another peaceful New Year’s eve in Manhattan at Death and Company, when a friend called to suggest that I drop everything and fly to West Texas to see a minor country music legend play a show at a tiny honky tonk bar in a little town, pretty much in the middle of nowhere, so how could I say no? The show was excellent, and despite the obscurity, David Byrne showed up around 11:00. But I digress. 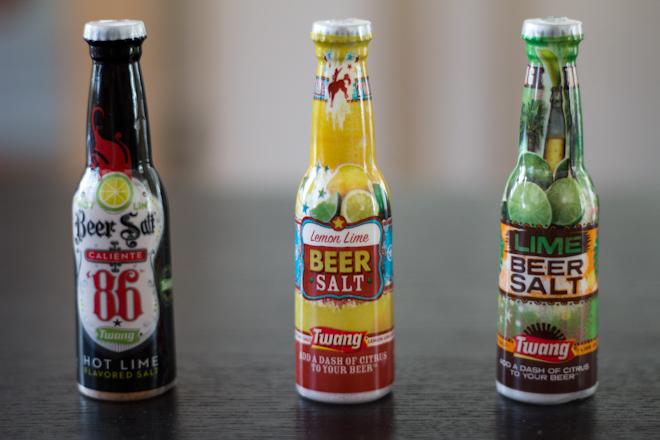 Every convenience store, liquor store, grocery store and fireworks stand across Texas had a display of Beer Salt, petite plastic shakers in the shape of a long-neck filled with flavored salt. It was even saw it on several bars in Austin and Houston. My first response was revulsion, then two thoughts crossed my mind. First, my father used to put salt in his Bud Light, but I never knew if this was entirely for flavor or if it was just to execute his favorite magic trick. Second, we put salt on the rims of margaritas, and even closer, on micheladas. For any purist who has been scoffing from the start of the paragraph, contain yourself, because I would wager that when it comes to food, you salt just about everything. It’s a flavor enhancer, and our bodies crave it, so we are biologically predisposed to enjoy it. I wouldn’t use this with a dark, full-bodied craft beer, but with any brew you might have sucked down at a keg party, it works quite nicely. Beyond that, all three flavors are great for sprinkling on an avocado.